As the Collaborative Applicant for the Chittenden County Homeless Alliance Continuum of Care, the Community & Economic Development Office (CEDO) is accepting proposals for new, renewed, expanded or bonus projects as outlined below with Continuum of Care Homeless Assistance funding from the U.S. Department of Housing and Urban Development (HUD). Chittenden County Homeless Alliance (CCHA) Continuum of Care is soliciting proposals that address housing and service priorities established through the Continuum of Care, with priority for serving vulnerable populations including chronically homeless persons, survivors of domestic violence, unaccompanied youth, and families with children. Any eligible entity wishing to submit a request to fund a NEW and/or RENEWAL or Permanent Housing Bonus or Domestic Violence Bonus CoC Project during this year’s HUD CoC NOFA must complete the attached form (Word doc) and submit it electronically to the Community & Economic Development Office (Marcy Esbjerg, mesbjerg@burlingtonvt.gov) before 4:00 PM on Monday, July 23, 2018. Only one request per form. Organizations that do not currently receive CCHA CoC program funding are encouraged to submit proposals. Proposals are also welcome from current recipients of this funding. For more information, please contact the CCHA Collaborative Applicant, Marcy Esbjerg of CEDO, at mesbjerg@burlingtonvt.gov, 802.865.7171. 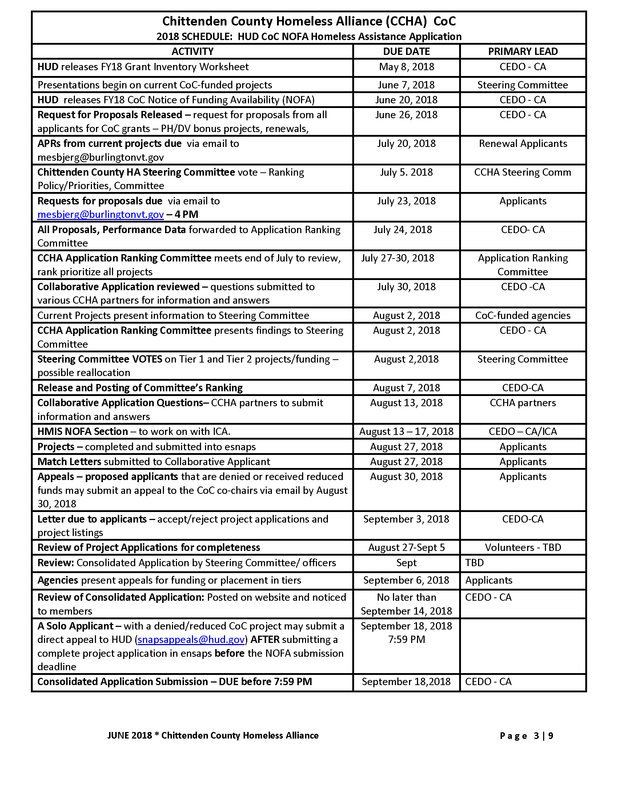 Click here (or see page 3 of the Request for Proposals) for a complete timeline/deadlines associated with the CCHA application process for the FFY2018 HUD CoC NOFA.